The road through Zion National Park, Utah. As I have mentioned in the past, my favorite HDR technique is to use graduated neutral density filters whenever possible. I like the results obtained with these filters, and I would much rather spend a few extra minutes in the field then behind a computer using Photoshop. But, if the transition between the brights and darks isn’t a relatively straight line, filters really don’t work. In this case, I have used HDR software such as Photomatrix with varing degrees of success. I have written about that in the past as well, you can read more here: HDR Photography. Last summer, with the release of Photoshop CS3, I started using the Photomerge function for my HDR photos. It takes a bit of extra effort, by I like having the control over the final results, and I think I am able to get a little more natural looking image. When I use the Photomerge function, I uncheck the box for “Blend images together”. Photomerge does a great job of matching up different images, but I prefer to do the blending myself with a layer mask. 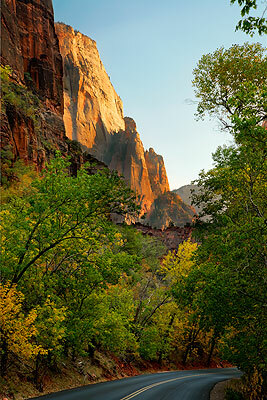 Now about a month ago when I was blending two images together for this photo of Zion Canyon it hit me – the mask I’m creating for the blend looks just like one of Tony’s luminosity masks. I thought that makes perfect sense, they are tonally based, and as long as the blend is accurate, they would even be self feathering. So I gave it a try and it worked great! I haven’t read about anyone else using this technique, although there are so many people smarter then I am out there, I’m sure many have thought of it, and tried it out – but I was still excited to share my “discovery” on the blog. Well, I dug up a number of photos from our last trip that needed blending and started working on them so that I would have a nice example for the blog – and to be honest, the technique really didn’t work all that well in many cases. But when it works, it works great and the technique can be a big help. In the above photo for example, I had to do some additional blending on the sunlit mountain with a brush set at 15% – but it did a great job with the tree against the sky – an area I could have never blended by hand. So in summery, using Photomerge and luminosity masks may not the the holly grail of HDR, but it is a worthwhile technique that is worth further experimentation. A lot more can be done if you make copies of other channels from other image modes and make masks using them. The possibilities are infinite and the results vary but give it a try and you’ll see what I mean. Hey thanks for the tip Koray, I will have to experiment with the concept. Was this nice picture taken in Feb.? I’m surprised to see green trees in Feb. Is there any snow in Jan. and Feb.? We plan to go there in the end of Jan. , 2011. No, it was actually taken on October 26th. You could easily find snow and cold weather during that time of year. I have only been there once during that time period and it was snowing. 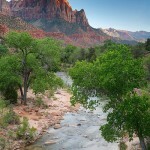 I prefer visiting Zion at the end of October. Have fun.